As with Berlin marathon, the top three of the elite field all have sub 20 PR's going into this Abbott World Marathon Majors race so it should be a speedy one as long as those storms don’t hit early. With 1st and 3rd place from last year’s race (Tirunesh Dibaba and Jordan Hasay) not in the running this year, it might see that Brigid Kosgei who placed 2nd in 2:20:22 in 2017 would be the favourite to win this race, but is that the case? Let’s have a look at who will be hitting the streets of Chi-Town. I’ll preview the top 3 by time and a few others. Feel free to request info on any you’re interested in that I haven’t covered and I’ll add them. After running a 3 minute PR of 2:19:17 in Dubai earlier this year, 22 year old Roza is the 10th fastest female marathoner of all time (list here - see how Berlin 2018 affected it!). This’ll be her first bash at a majors race and only her 5th marathon so she’s not as experience as some of the field but she’s certainly speedy and therefore definitely one to watch. However, she’s never run more than one in a year before so it’ll be interesting to see if that makes any difference. Florence started Chi-Marathon last year but dropped out at the 25k mark with a ‘muscular injury’. It’s unclear as to whether this is also the reason why she has no recorded race times this year. So, with a PB set back in 2011 and nothing to go off in 2018 it’s hard to know what form Florence is in. Her peak year was 2015 when she set the Half Marathon World Record and won Chicago marathon, winning again in 2016. Not only does she know the course as a women’s winner, but she’s married to Moses Mosop who was a course record holder at the at Chicago for a while. I’d love to listen the family chat the week before the race in that household! She’s also known for having a gutsy style of running, often leading from early on. I like her style. With a box-fresh PB set in Tokyo in Feb this year Dibaba (not last year’s winner, Tirunesh) has been chipping away at her marathon times, running one a year since 2012. After wavering around the 2:23 mark for a few years she’s taken a good leap down into the sub 20’s this spring so it seems unlikely to me that she’s going to pull anything more out of the hat, but if the race isn’t a fast one then her experience and consistency could come into play - she’s finished 3rd at this race twice before in ‘14 and ‘15. The only runner from last year’s top 5 back again this year! She ran a big PB to finish second last year and followed it 9 weeks later with a 5min CR at Honolulu Narathon. She then came second at London Marathon in warmer conditions with another new PB time.If she can perform that well in a race where everyone was struggling with the heat perhaps that will with a potentially humid Chicago. Looks like she’s on the up and she’s finished first or second in 7 of the 8 marathons that she has run. After finishing first American and 6th OA at the 2017 London Marathon, her 2nd ever marathon. Thweatt has been recovering from osteitis pubis which was in evidence during London. It’s been a very slow and carful process getting back into things but she started her comeback this year with a 1:10:17 PB at the Gold Coast Half Marathon. On her twitter she says that the main reason she chose Chicago was to run race Jordan Hasay and Amy Cragg, so it’s even more that they’ve had to pull out. Having just celebrated her 40th, I’m hoping Aly is going to celebrate in style by taking it out to the Chi Marathon. 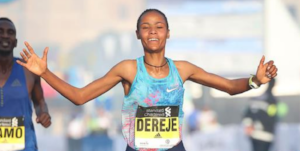 She sadly had to pull out of the European Champs earlier this year because she knew she couldn’t run her best having not had enough time to get back into training after an operation on her heel. She has been working hard, running a solid but not earth shattering performance (her assessment) at the Great North Run HM and has since been training in Font Romeu. I’d love to see something like her World Championships run though I suspect it wouldn’t be wise (much as I’d love it) and this will be part of the route back to bigger better things. Though she competes for Greece in the Olympic, Papas has dual USA and Greek nationality. Aside from the fact that she did a retro style photo shoot for Runner’s world which is just AWESOME, she is also a film maker who co-wrote and starred in Tracktown and just seems generally talented. She actually paced at the Chicago Marathon back in 2014. She competed at the 10000m in Rio but doesn’t seem to have raced much since. You can see her interview with WomensRunning here. You can check out the full spreadsheet here which has a bit more info on some of the other athletes I haven’t covered.